I love the 50s style, especially the first one you posted. To be honest, I've never really considered wedding dresses. I know what i don't want, but I haven't ever pictured myself in a dress, simply because who knows when, or even if, that will ever happen. I like plainer materials that are rich, expensive, which speak for themselves, more than heavily decorated fabrics with loads of sequins or seed pearls or stuff like that. I like mantila veils and longer style veils, but I also like bird cage styles. Beyond that, I can't say that I've really thought. I have a much better idea of what I'd like the bridesmaids to wear, the mother of the bride, and what flowers and cake I'd pick. yes, it's very over the top! but i LOVE it! I think when the time comes I'm more than likely going to go for the vintage style dress as it's more my general style and personality. I would love to have a gown but I'd probably trip over it. The first one is really looking pretty because of its back the grace of whole dress will increase and you look different in your wedding. I love the contemporary ones with the sheer meterial. I think they're elegant. But at the same time I also love beautiful things people can do with dresses no matter what the style. I wouldn't ever go for anything extravagant myself, but I still adore other styles. Wow!! Thanks for sharing the wedding collection. I really like all the dresses. I feel some what bore to white dress. now a day colorful bridal dresses are also in fashion. tail is must for bridal gown. This was my dress, i got it for our beach wedding this past summer, i took these photos of it from the designers website, when i saw it in a brides magazine i knew it was the one. When i went and tried it on that was it i loved it even more and bought it within ten minutes of having it on. Bellagia beautiful dress! You looked stunning girly! Livingthedream, what a fabulous dress! I love it! 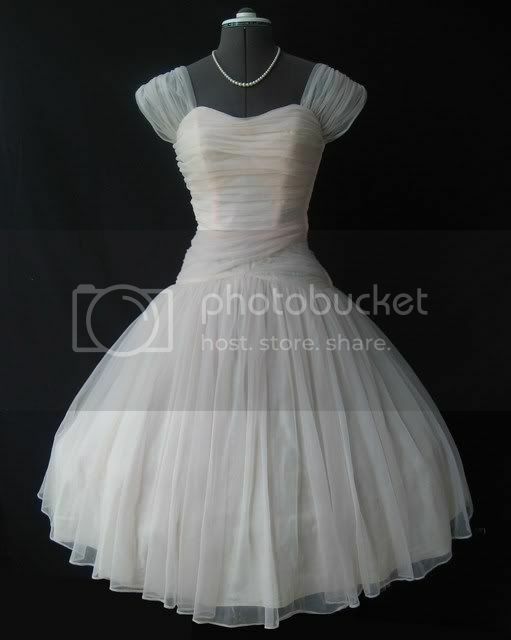 I really never wear wedding dress but I like plainer materials that are adorable and give rich look. Here's my dress. I like how it hug my curves and made them look really nice. I love your dress vixie, it is definetly my style! How beautiful and gorgeous the dress is bellagia !!! !If any one wear it she looks like a fairy. It would be the dress value. My first choice is the very top photo those sleek dresses would definitely make my man's heart melt, and that's more important to me me than a poofy princess dress but that's just my opinion.... and the slender one's are hopefully allot cheaper haha! I would/could never spend an atrocious amount of money on a dress grandma would definitely not approve of an insane price tag a few thousand would probably be to much for her. I could also easily fall int love with a 50's vintage style lace dress but it would have to be a sleek design as well after writing this I am starting to think I may just have something against tool lol. I have just one word for this... WOW! All wedding dresses are so amazing. I liked it so much. ooo a beauty forum with a bridal section! loving it so far! I got my wedding dress a few months ago and my first dress fitting will be in Feb 2012 lol really far away i know!